Hidden Lake | AVB Inc. If there are times that generally work best for you, let us know. You may also include any specific homes you'd like to see, and any other details or questions you may have. Thank you for your request. It's been received and we will get back with you promptly. Ask us anything you like and we'll get back to you promptly with an answer. Thank you for your question. It's been received and we will get back with you promptly with an answer. Build a home or see available new homes in Hidden Lake. The caretaker’s stone cottage welcomes residents home as they enter this private community in Richland Township. Heavily wooded, each home in Hidden Lake is strategically located between natural buffers of habitat preserve and environmentally sensitive areas to maximize privacy and the abundance of green living. Hidden Lake features amenities such as nature trails and an open community park complete with sledding hill. Tennis and basketball courts, as well as a sports field are nestled next to the lake, which offers private access for all residents. 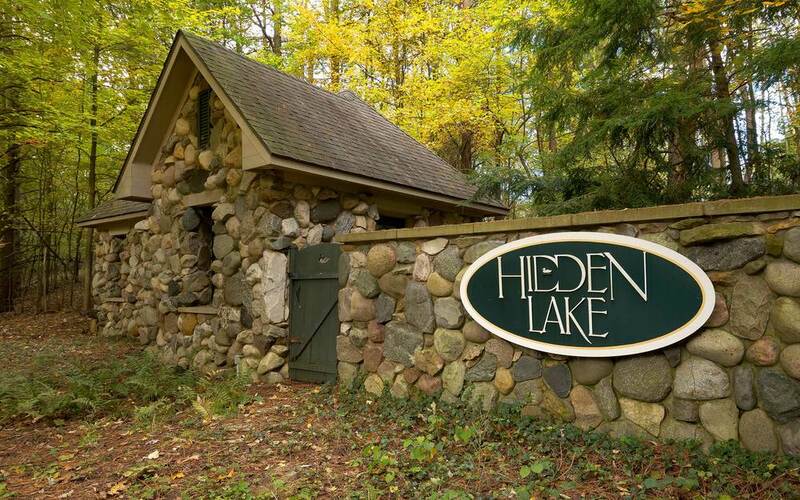 Hidden Lake is conveniently located just minutes from Kalamazoo and Battle Creek in the Gull Lake School District. Homes ranging from the low $500’s to the upper bracket for custom built homes. Home site sizes vary from half an acre to one and half acres and are priced from $65,000 to $150,000. Home sites include wooded and cul-de-sac locations. All homes are serviced by city water, natural gas, electrical and telephone. Services and utilities are all installed underground. View Available Homes in Hidden Lake. No new homes are currently available in this community, but we're working on it. In the mean time, you might consider building a new home from the ground up in this community. It takes a continual eye on the market to find the best products, finishes and prices. It's part of our commitment to safe, quality homes.